Heading to a brand new circuit means drivers get a fresh set of surroundings, and can participate in a lot of new local traditions. Rather than visiting the koala bears at the zoo like they do in Australia, or wearing ten gallon hats in the USA, this time it was all about weaving carpets. As you do. Also this week, points for sharing cute baby pictures and for getting feisty in the press conference. It's been stable at the top of the rankings table for a couple of weeks now, but you can have an impact on that. If you spot the drivers doing anything pointsworthy, do let me know! +1 Fernando Alonso: Knowing he picked the right job after trying to craft a blanket in Baku. +1 Nico Rosberg: Quite a fancy preview video for Baku, with some fun circuit facts along the way. Watch out for half naked David Coulthard though. +1 Sergio Pérez: Putting in some extra practice ahead of the European Grand Prix by taking the new Codemasters F1 game for a spin. +2 Nico Hülkenberg: I just really like this photo from Hulk's point of view at the press conference. +1 Nico Rosberg: Taking a selfie with yourself is silly, but I like it. +1 Esteban Gutiérrez: Baby Esteban is very cute, squinting into the sun. +2 Carlos Sainz Jr: Lovely interaction with Fernando Alonso during the Baku pre-race press conference. A journalist asked who will be the highest placed Spanish driver at the end of the year, and as Sainz says here: Challenge accepted! +2 Sebastian Vettel: Some lovely words about Vettel after the four times champ spent some time with the Make-A-Wish foundation. 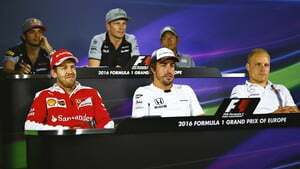 +3 Sebastian Vettel: Keen to know the result of Le Mans, Vettel interrupts the post-race press conference - and swears about his findings!